A teenager caught dealing drugs in Chichester in order to pay off another drug dealer has been spared jail. 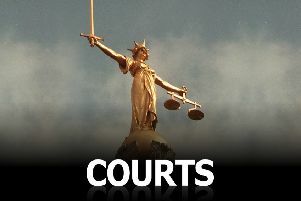 Jeremy Seeley, 18, was spotted on CCTV near Westgate Leisure Centre – a known haunt for cannabis smokers, a court heard. Seeley, of Bognor Road, tried to ditch his stash of drugs but he was arrested by officers who later recovered it. He pleaded guilty to possessing cannabis with intent to supply and appeared at Portsmouth Crown Court today for sentencing. When police examined his bag they found 52grams of cannabis divided into wraps and £165.75 in cash, the court heard. A probation report found that Seeley ‘was aware that it was wrong but did not quite appreciate how seriously it would be viewed’. Defence barrister Mark Kessler called for Seeley not to be sent immediately to jail owing to his age, early admissions to the police and lack of relevant previous convictions. Judge Roger Hetherington said: “You were in an area known to be frequented by drug users. Seeley was given a 10-month prison sentence, suspended for 18 months. He was also ordered to complete 25 rehabilitation sessions.